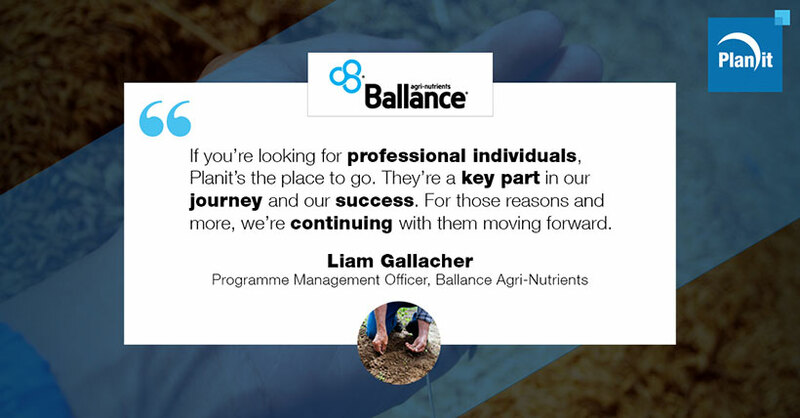 Ballance Agri-Nutrients is a New Zealand farmer-owned co-operative that helps its customers to farm more productively, proﬁtably and sustainably. One of its recent digital products is MyBallance, a new online platform designed to make it much easier for customers to do business with the co-operative. MyBallance contains all fertiliser information in one secure place, enabling fertiliser orders and management decisions on any device – desktop, laptop, tablet or mobile – at any time. Programme Management Officer, Liam Gallacher, manages the testing aspect of the new platform. “I received trusted recommendations from two members of our leadership team who’d had experience with Planit, so I was comfortable to approach them and get the conversation started. From that first meeting, there were two main reasons why I decided Planit was the right choice of testing partner for us. The view they had of the wider technology immediately told me they’re not a body shop. They’re interested in the business and being constructively involved. They genuinely wanted to know and collaborate in our best interests. Their flexibility in working around a budget to suit. This particularly useful to us since we had non-existent internal capability. Their methodical professional approach to testing. From the get-go, Planit wanted the outcome to be successful. Their ability to engage in aspects of the business. It’s not just about testing and they contribute value about quality too. They weren’t afraid to raise issues to prevent problems. The wider project also benefited from awareness of the broader implications. Highly dependable, eager and approachable Planit people that were willing to take on ad-hoc aspects in our best interests. Nothing was too much trouble and they really felt like a part of our team. “Planit has delivered a high quality, consistent and repeatable plan for testing to take us well into the future. The relationship is a mutual partnership and not a simple vendor relationship. Visibility of our risk position with proactive strategies offered to address any issues. Improved customer experience based on 100% positive feedback. Increased product quality and easy access helped us gain way more business since the platform was launched, and customer uptake figures are considerably higher. We’ve also received strong feedback from customers saying they love the features. Receiving the global innovation award from SAP was wonderful recognition too. Planit is committed to continuous improvement, both ours and theirs. They have proven their commitment constantly and we have a high level of confidence in their ability to deliver. We plan to develop automated processes and tools with Planit’s help.